I hate being late. It’s one of my pet peeves and one of my biggest anxieties in life. I have such a chronic fear of being late that whenever I’m about to begin a new job or whether it’s the first day of school, I have nightmares the night before about sleeping in and being late on my first day and making a bad impression. Take this week for example. I was to begin a new placement on Monday, and I was nervous already about it, the whole weekend. It was in a completely new and faraway part of Toronto that I did a little drive test to make sure that I didn’t miss my exit or get lost on Monday morning. So I did my little driving expedition to the school and all was fine. But that night I dreamt that I slept in, got lost, and showed up late to my placement. I woke up in a cold sweat at 5 o’clock thinking that I was definitely late. My relief was only short-lived: I had about half an hour of sleep left before I had to wake up. This recipe is not late. It is actually the opposite of late. It’s early! You guys remember these little poppers, right? They’re actually my most popular recipe on Pinterest. For reasons I don’t understand, they have been pinned almost 700 times! That might not be that big of a number for some bloggers whose recipes can pinned thousands of times, but for me, a blogger whose recipes barely got any pins up until a few months ago, I’m bowled over by the love for these poppers. If you haven’t tried the recipe yet, what are you waiting for?! These sandwiches are inspired by those poppers. There’s a bunch of recipes I browsed on Pinterest when I first set out to make this recipe, but this recipe has been change and adapted to what my family likes (lots of cheddar cheese!). 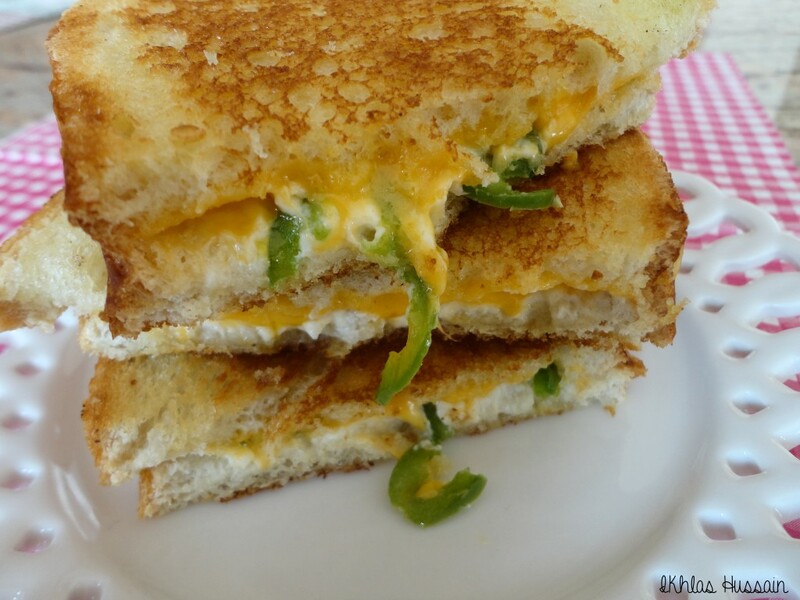 Incredibly easy, these sandwiches are best served on the spot; the cream cheese/cheddar cheese mixture melts in your mouth, while the poppers provide a nice crunch and a little pop of spice. 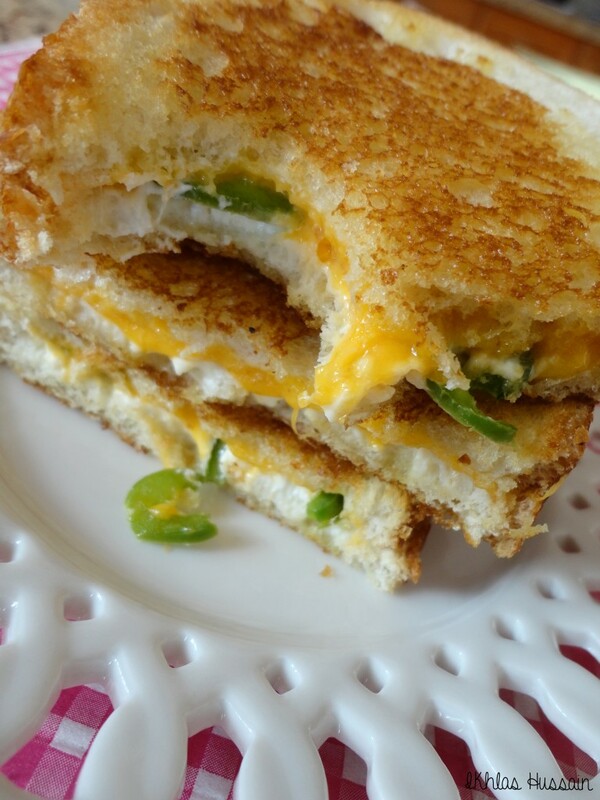 Spread the cream cheese generously onto the non-buttered side of the bread, and top with shredded cheese and jalapeno peppers. Top with second slice of bread. Heat a skillet on medium heat and cook the sandwich for 1-2 minutes on each side, or until bread is golden and filling is warm. Serve warm. Variation: Broil sliced jalapeno peppers on high for 1-2 minutes or until lightly scorched before adding to sandwiches. Recipe by Ikhlas Hussain. Biting into one of these sandwiches is kind of biting into a hot, melt-in-your-mouth grilled cheese sandwich, but with SO much flavour! I love the combination of the smooth cream cheese and the melted, sharp cheddar cheese. 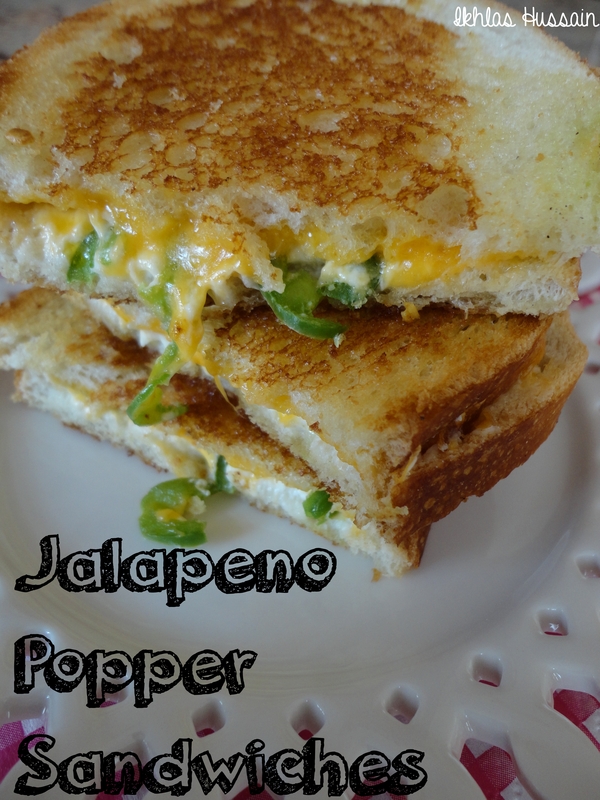 That’s not to mention the crunchy, spicy slices of jalapenos sprinkled throughout. 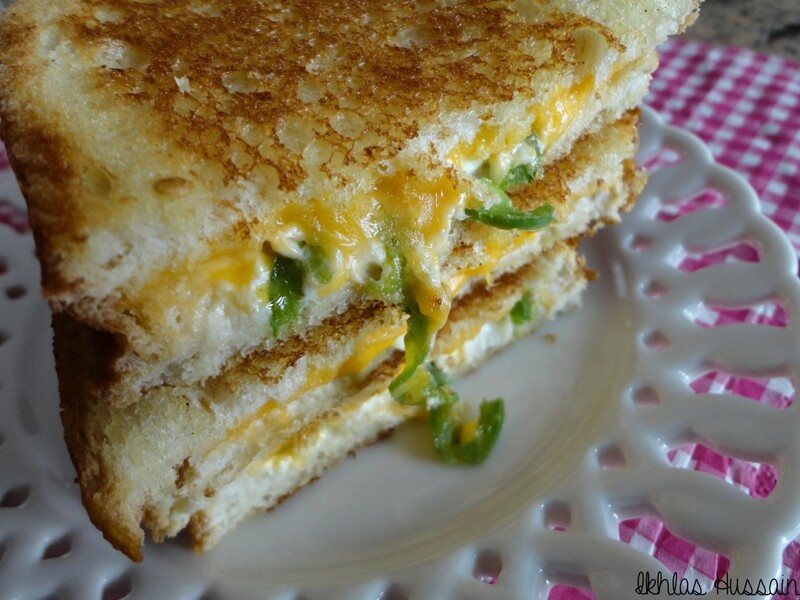 Sandwiched in between two slices of buttery bread, these sandwiches were gone within minutes of my making them! Made with almost all the same ingredients as your classic poppers, these sandwiches are a lot easier and quicker to make (and clean up! ), especially when you’re craving that zippy popper taste. Made within minutes with a few ingredients, these sandwiches are sure to become a staple in your sandwich repertoire. So try them out and let me know how you get on! This entry was posted in Recipes, Savoury and tagged recipes, savoury.